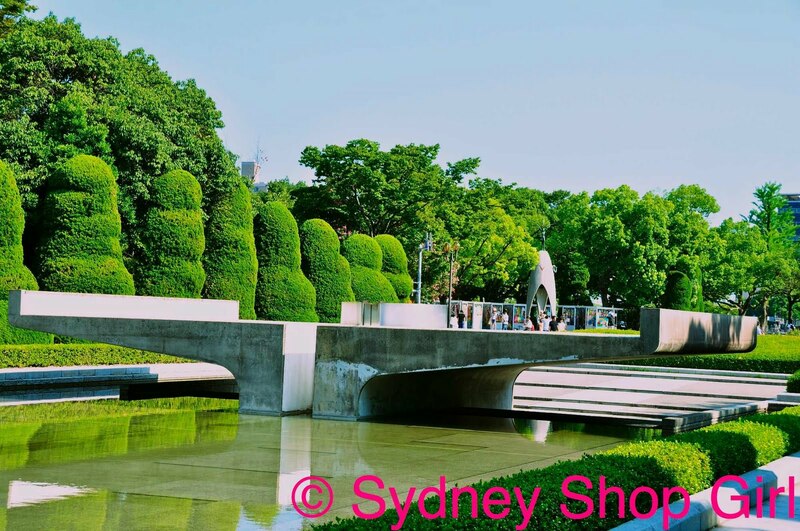 Sydney Shop Girl: The Peace Memorial Park, Hiroshima. 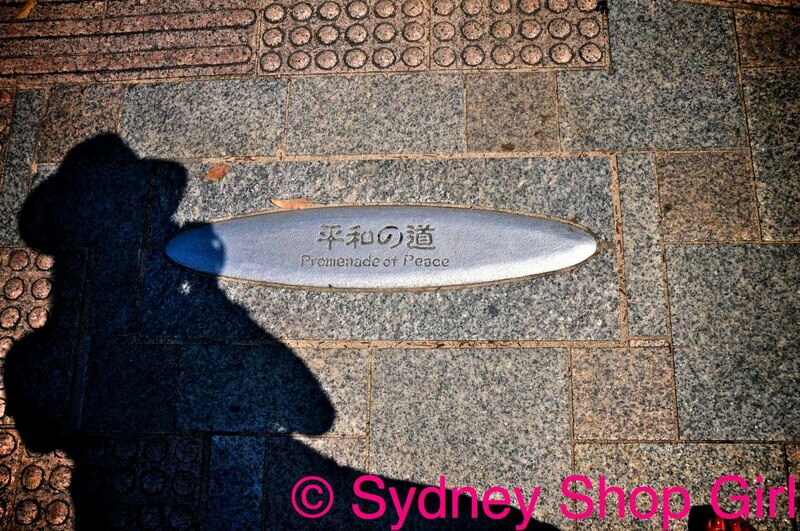 I wonder how visiting Japanese react when they see our sushi in Australia? I'll put it diplomatically when I say that what we eat here is 'adapted to local tastes'. My favourite fillings are teriyaki chicken, avocado, salmon, crab meat and tuna with mayonnaise. Sometimes all together. Just kidding. The strange thing is, I didn't find any of these in Japan. I went to Japan naively thinking that Japanese cuisine in Sydney (basically a city of authenticity craving food lovers) was 'completely authentic' and identical to what would be found in Japan. While I was away, I was reading an article about sushi chefs and the way the industry has shrunk in Japan but is growing at a rapid place in the rest of the world. It has become lucrative for chefs to migrate overseas for work. I understand that the traditional life of a sushi chef in Japan is to train and then work for ages on the peripheral aspects of the restaurant (read dish washing and mopping) before finally being allowed to touch the rice. This doesn't happen as much outside of Japan where a chef would start making sushi on day one of their job. The downside, I guess, for those that work outside of Japan is the challenge of finding out how to cater to the palates of their adopted country. The choice of fillings, the sauces and seasonings. Some traditional techniques may be superfluous in other countries where the choice of fresh produce is more restricted. I got my fix of 'Australian sushi' for dinner tonight. A great start to a quiet night in. 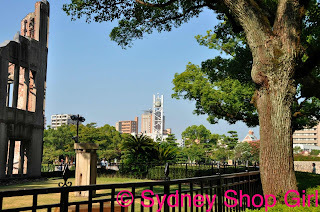 Thank you to everyone who has made comments about my Japan trip posts and also to those anonymous people who have clicked and stayed for a few minutes. I gained reader from Islamabad today. It's a pretty mind blowing experience seeing how far blogs travel across the world using the magic of broadband. Insert respect for Julia Gillard and the ALP Green Alliance here. I really do hope that their National Broadband Plan comes to fruition. Sadly, we are up to the final stop on the trip. Tonight's photos are from Hiroshima. 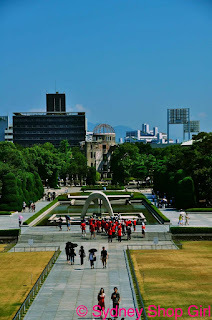 Hiroshima was one place I had to visit whilst we were in Japan. 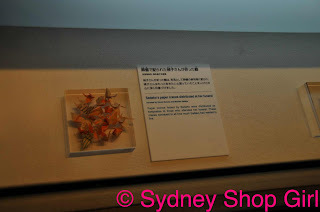 I was 10 years old when I first read Sadako and the Thousand Paper Cranes. The themes of courage, death, war and pain were a hard hitting combination for me at the time. 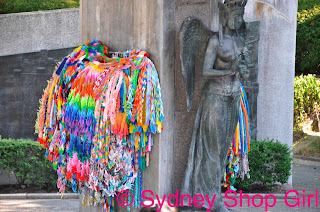 Especially as Sadako was about my age when she died. The aftermath of war is a mixture of grief, loss, suffering, hope for the future and never forgetting. 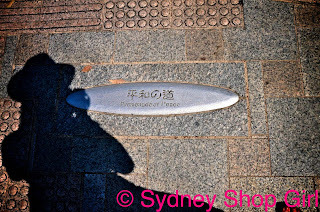 Sadako's story is certainly one I've never forgotten. 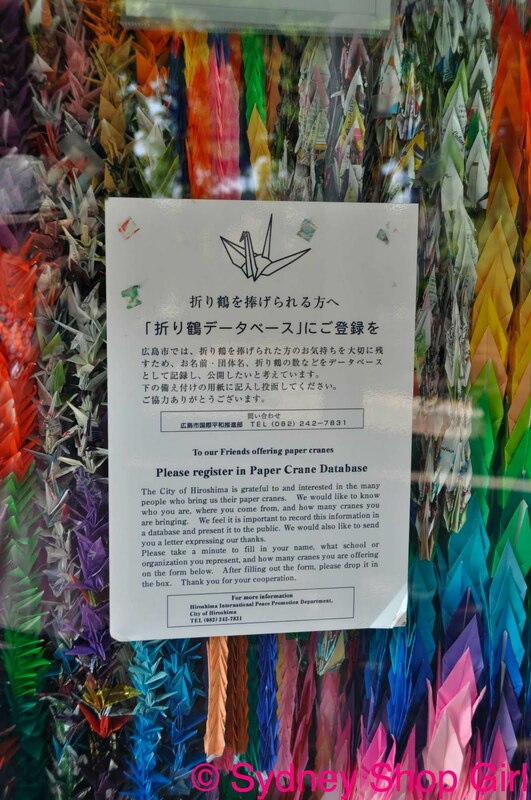 Over the years, I've re-read the book and folded those paper cranes. 25 years later (does that sound any less harsh than a quarter of a century?!? ), I found myself in Hiroshima, a modern and vibrant city waiting for the tram to take me to the Peace Park. We stayed at the Hotel New Hiroden. 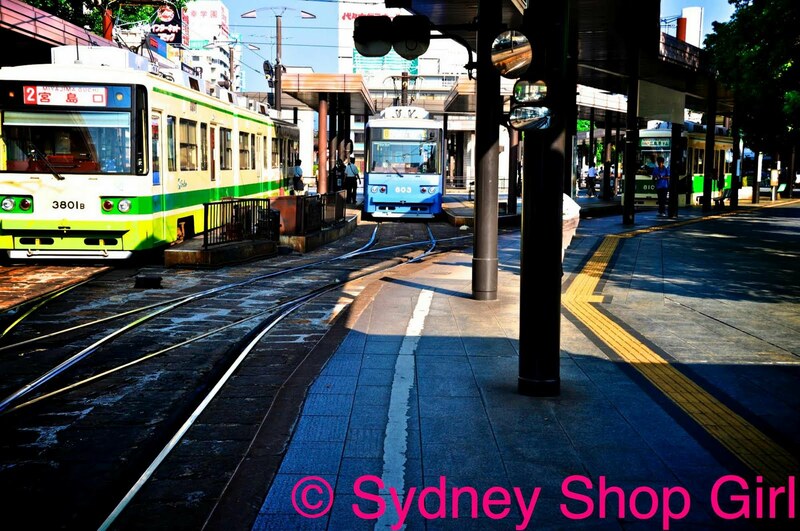 Just a 5 minute walk from the combined train and tram station. 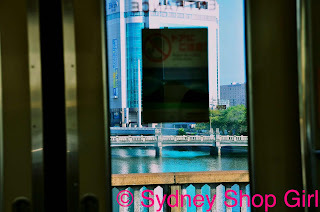 Looking out the window of the tram, it didn't go unnoticed that all the buildings around me were modern. The past was truly erased here. The A Bomb Dome seemed smaller than what I thought it would be. Its crumbling European lines and dome a stark contrast to the immaculate modern buildings around it. 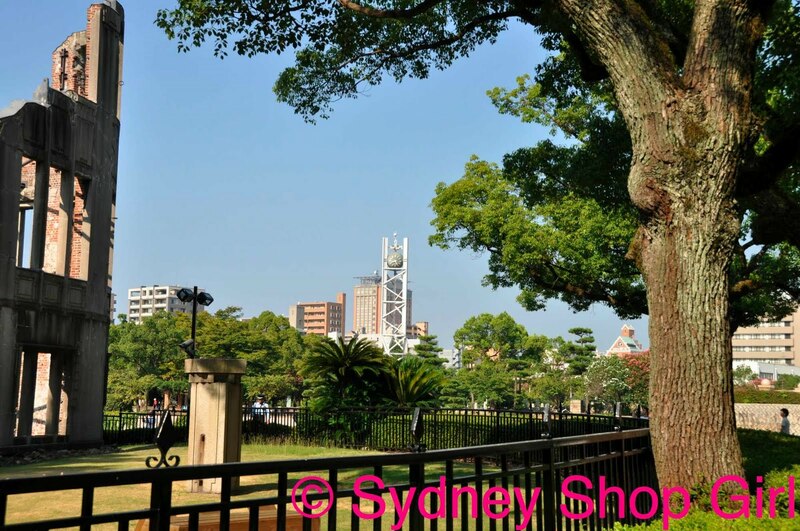 A UNESCO World Heritage site, the dome is surrounded by shady trees and paths. It used to be the Industrial Promotion Hall and was built by a Czech architect in 1915. 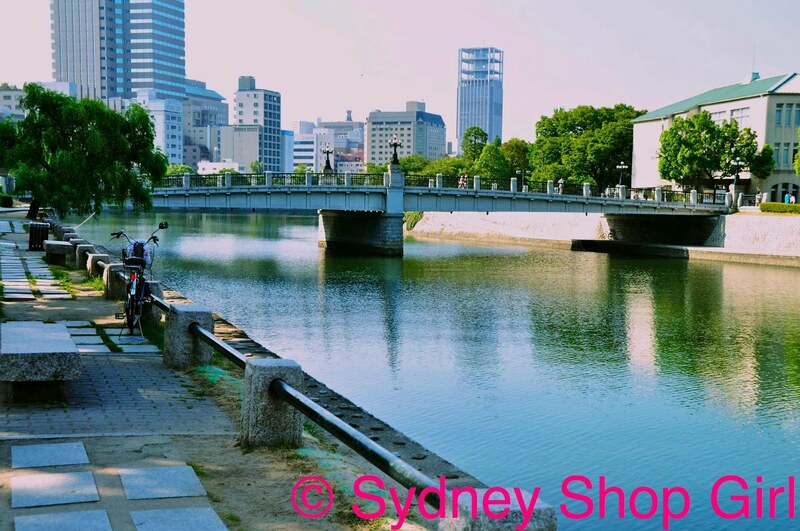 The Peace Park is bounded by two rivers, the Motoyasu-gawa and the Ota-gawa. 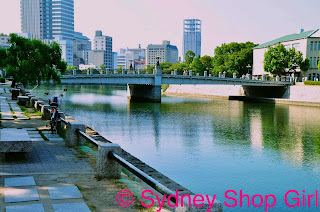 As you walk from the A Bomb Dome towards the museums, there are shrines dotted along the banks of the river. They commemorate different groups of people whose lives were lost after that devastating moment on the morning of August 6, 1945. This memorial honours the souls of school children who died such painful protracted deaths as a result of heat damage from the bomb. 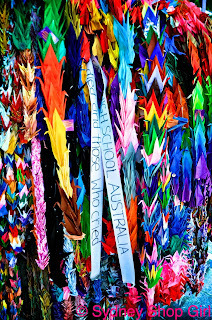 Our visit was after the 65th memorial of the bomb and thousands of cranes were still decorating the memorials. The scorching heat was a haunting physical reminder of what it might have been like on that summer's day when the bomb exploded. Around Sadako's statue are cranes from children all over the world. 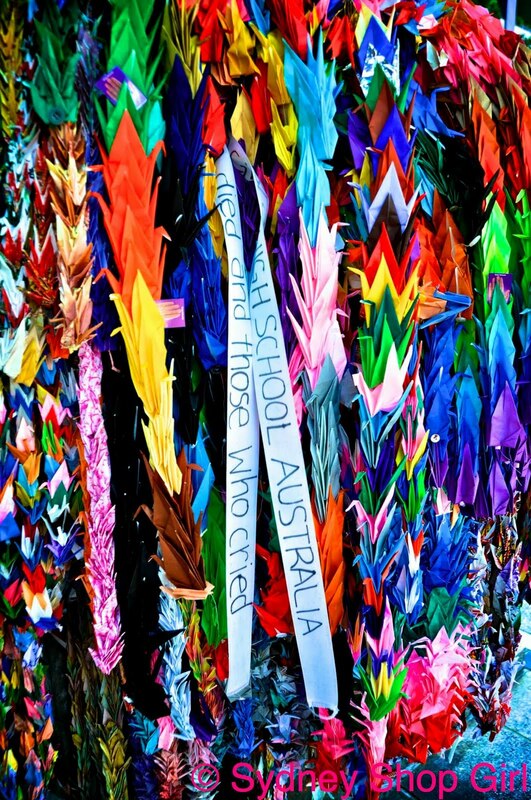 The cranes are hung in covered display areas and there is a registry for those that bring the cranes to the memorial. I found cranes from Australia. 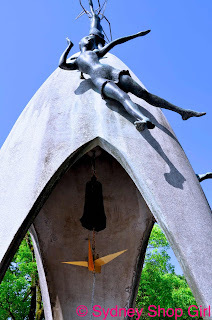 Sadako's statue with the golden crane. Its official name is the Children's Peace Monument. Walking through the Peace Park was indeed peaceful. 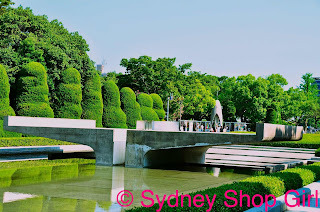 The memories of lives lost in war had a subduing effect on everyone who walked through the park. The air seemed still. As if the laughter and chatter that never had a chance to pass the lips of those who died was still very much present, just waiting to escape to remind the living that souls live eternally free of the physical pain of the living. It was a strange feeling and I remember feeling that way in Washington at the memorials there and also at the ANZAC memorials in Australia. The Peace Flame. It has burned continuously since 1964. The Memorial Cenotaph, built in 1952. 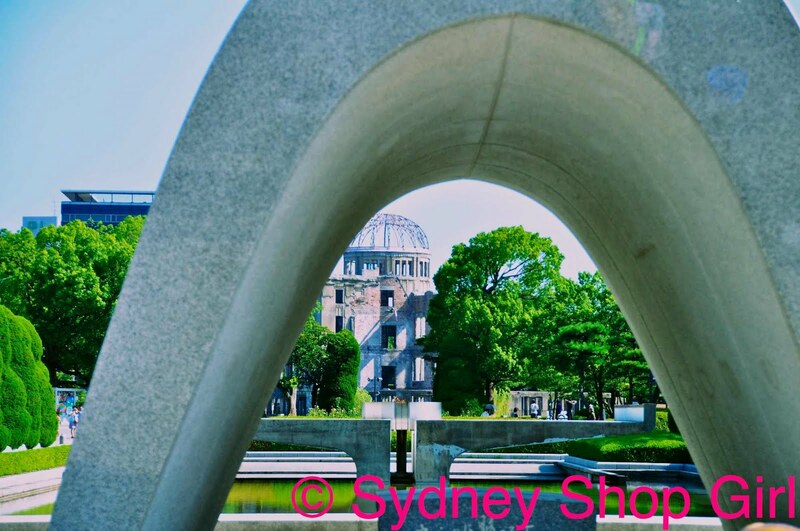 It is built in the Shinto style and the arch represents shelter for the souls of the dead. The words on the Memorial Cenotaph read 'Repose ye in Peace, for the error shall not be repeated". 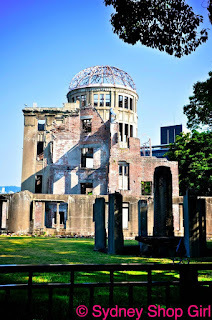 Visiting the Hiroshima Peace Memorial Museum was a harrowing experience. It offers an account of devastation as a consequence of the bomb and includes models of what Hiroshima looked like before and after the bomb. 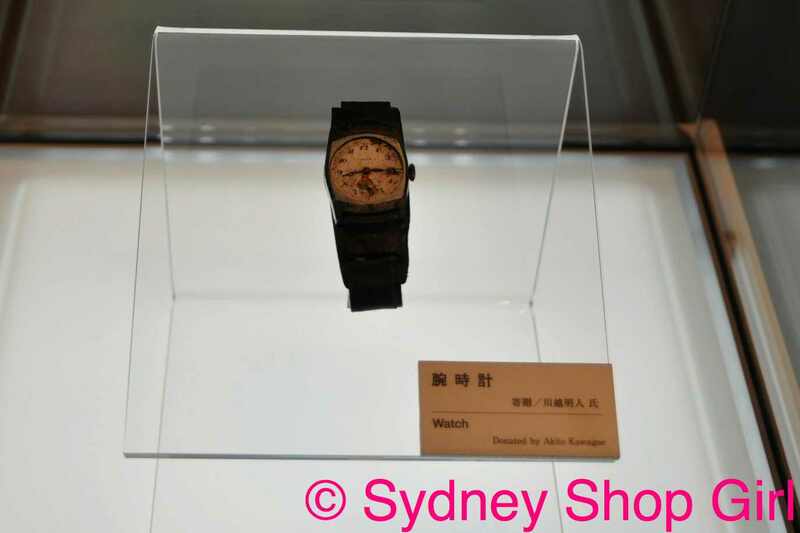 The most disturbing exhibits were personal items like the watch that stopped the moment the bomb exploded. There were the clothes and lunch boxes of children caught in the furnace of heat of the bomb. Many things too painful to describe. 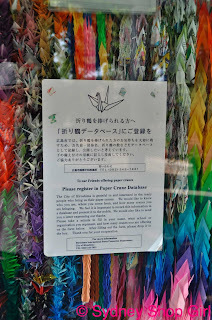 I did find Sadako's paper cranes. 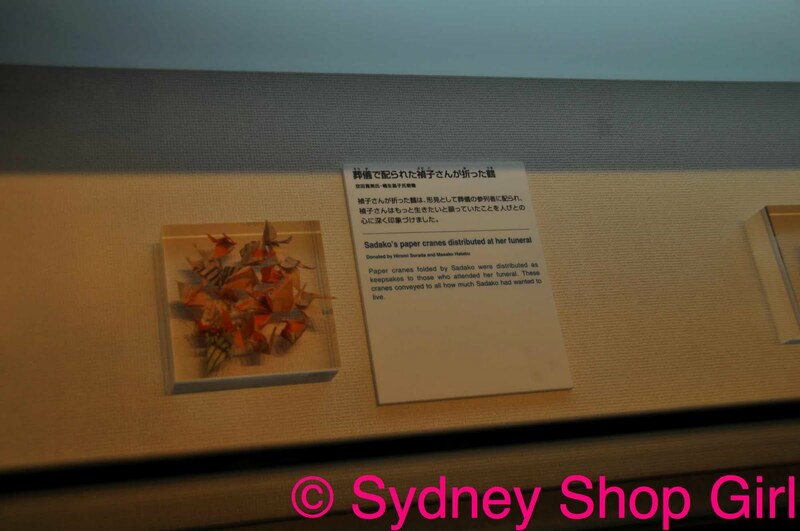 The museum also offered hope for a peaceful future. One of the final exhibits was a wall of telegrams that successive Mayors of Hiroshima have sent world leaders each time a nuclear test has occurred, seeking a more peaceful solution than more bombs. I looked out the window after viewing the exhibits and hoped that this really was a path to peace that the whole world would eventually walk together. I'm going to end this post on a light note. Literally. Where there's sun there's shadows. In my case, straw hat shaped shadows. 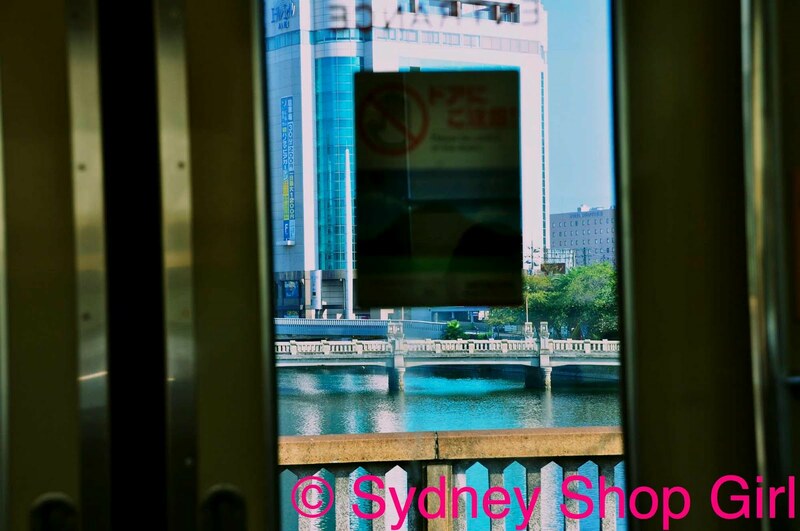 Roll on Summer in Sydney 2010! and sushi which BTW I love to eat does have local adaptations here too.